The South Korean Minimum Wage Commission is an entity that negotiates and decides the next year’s minimum wage. Established in 1978, the commission’s meetings have always been held behind closed doors. We can only assume and imagine the discussion at the previous year’s meeting to find out how the current year’s minimum wage was decided. To understand a decision about the present, we have to look back to a past meeting where the future wage was negotiated. 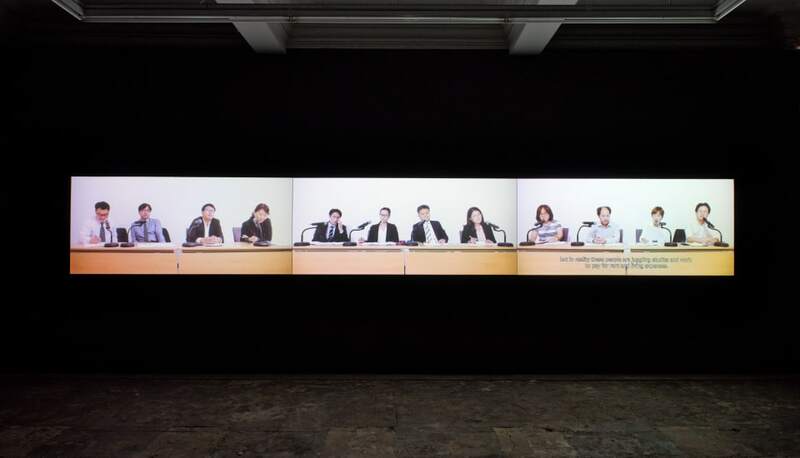 The three-channel video installation Twelve is based on the content of the 2015 meeting with reference to various documents. Twelve characters represent the twelve times of the meeting. In addition, a sequentially operating, repetitive machine movement is juxtaposed with the meeting scenes. The work emphasizes the fact that what is called a formal, public and human discussion is being held only behind closed doors or in a private space, while simultaneously questioning what the future of a nation and its democracy should be. Curated by AV Festival: Meanwhile, what about Socialism? in partnership with the Korean Cultural Centre UK. UK premiere. AV Festival 2018: 'Meanwhile, what about Socialism?' Part Two presents new work by artists and filmmakers that considers the future. The possibilities of going beyond capitalism, the impact of the fourth industrial revolution and automation, international solidarity against the oppressive economies and unfinished wars, social justice for past inequalities and what it means to be a survivor of political collapse. Jeamin Cha presents a screening of five short films made between 2010 and 2014. Her work takes a critical perspective on society and politics, often focusing on labour issues and urban development in South Korea. In Chroma-key and Labyrinth, Cha examines the notion of abstract labour, juxtaposing footage of the hands of a cable installation worker with footage of the same hands in front of a chroma-key set. Fog and Smoke follows the last remaining fisherman in the old town as he drives across a construction site in South Korea, abandoned due to the global financial crisis. Autodidact narrates the conversation Cha had with Hur Youngchun, a man who taught himself forensic science in order to uncover the truth behind the death of his son, who died in 1984 while doing military service. It is not a question but a balloon stems from the artists research into controversial political figure Sukyung Lim, best known for illegally visiting North Korea in 1989.